Mattishall is a village situated near the geographical centre of Norfolk. The 2011 census showed the population as 2617. MATESHALA is the spelling found in the Domesday Book of 1086. This panel depicts a hoard of 1100 Roman coins that were found in the village in 1968. MATESHAL shows a rural scene with sheep. The church was one of many in Norfolk that was built with money earned from the wool trade. Also on this panel are the coat of arms Caius and Gonville College, Cambridge which has had a connection with Mattishall since 1370. MATSALL shows Matthew Parker who was the first Archbishop appointed by Elizabeth I. 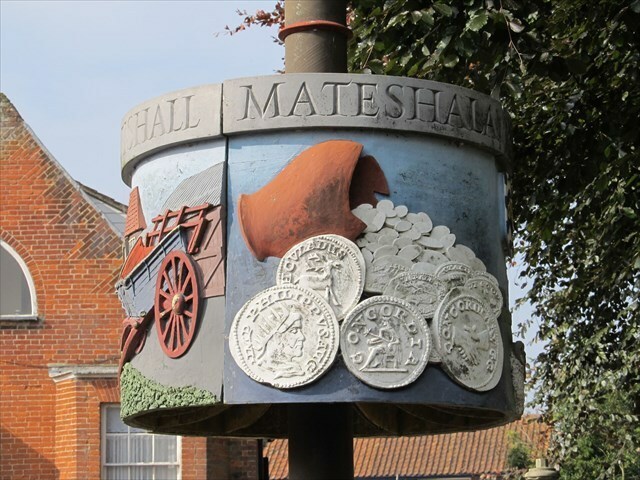 Although he was born in Norwich, he has a strong Mattishall connection through his wife, Margaret Harleston who was born and lived here. They married in 1547. He may have been the origin of the term "Nosy Parker," due to his habit when archbishop of making detailed enquiries about church matters and other things. MATTISHALL shows a tumbril which is a type of farm cart, painted in the colours of Dobbs Brothers. They were a local firm of Wheelwrights and Wagon Makers and their reputation for quality products was well known throughout East Anglia. The cache is a short walk away, along a footpath that can be quite muddy at times. Please TAKE CARE, especially with children, as part of the path is very close to a steep sided ditch.